Thirty years ago, U.S. Air Force Major William A. Buckingham, Jr., published the first comprehensive history of Operation Ranch Hand—the codename for American spraying of herbicides over South Vietnam and Laos during the Vietnam war. Buckingham’s narrative was part science, part politics, and part military operations. Even that official history acknowledged that twenty percent of South Vietnam’s forests—including some thirty-six percent of its mangrove forests—received eighteen million gallons of the best plant killers that American chemical companies could furnish. Derived from the same compounds used in commercial weed killers, these chemical agents had unimaginative names: Agent Pink, Agent Purple, Agent Blue, Agent White, Agent Green—and most infamously, Agent Orange. In the late 1960s, Agent Orange was identified by American scientists as carcinogenic, responsible for birth defects in the Vietnamese and for health problems among veterans. 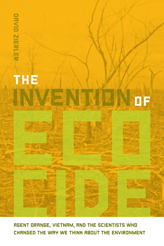 There was no index entry for “ecocide” in Buckingham’s tale, but he did reflect on what remained to be done at the end of combat operations: “Finally, the ecological consequences and long-range health effects of the herbicide program had to be assessed, a process which still continues.” Decades later, the same statement could be made, with the environmental and health impacts of these herbicides still contested, and the U.S. government taking slow steps to compensate selected veterans and to mitigate the environmental problems in Vietnam. And yet, the U.S. government did eventually stop using Agent Orange during the war, and subsequently promised not to be the first to use herbicides in future wars. In The Invention of Ecocide, David Zierler asks a straightforward question: why did the campaign against herbicidal warfare succeed? His book places considerable responsibility on the scientists who invoked the notion of “ecocide”—the destruction of entire ecosystems in Vietnam. As his subtitle suggests, their efforts went further—changing the way we think about the environment. “Ecocide” implied a problem that was much bigger than particular health risks to human beings, and it may even have suggested a challenge of planetary proportions. And yet despite the employment of a word that invoked such calamity, Zierler notes, these scientists’ success may be due to their attempts to stand aloof from both the antiwar movement and the environmental movement. Like Buckingham, Zierler published his study while employed by the United States government. However, Zierler’s book is not an “official” history, and it originated in his research as a doctoral student at Temple University, prior to his work at the United States Department of State. I asked Brian Balogh to comment on Zierler’s book because his work spans the history of technology and environmental history, engaging politics throughout. Like The Invention of Ecocide, Balogh’s book Chain Reaction examines the public dimensions of science—in Balogh’s case, the interplay of expertise and public participation in the American debates about nuclear power. In that work, Balogh pointed out that the public dimension of science is not simply a matter of experts educating the ignorant; instead, when these experts take the public stage, they give widespread attention to legitimate differences among scientists. Balogh more recently has been exploring the environmental dimensions of these issues from the nineteenth century to the present. Amy M. Hay’s work is complementary to Zierler’s as well, because she is currently writing a history of American attitudes toward the Agent Orange controversy. I was intrigued by the connections between this project and her prior work on community activism and public health at Love Canal—not just during the controversy there, but in the decades that followed. Hay already has argued for widening our understanding of these controversies. Regarding Love Canal, she underscored how public rhetoric drew from a sense of obligation to protect homes, children, and reproduction itself, while cultivating a strong connection between environmental damage and broader issues of social justice. Aside from the obvious connection—toxic chemicals—I was particularly interested to have her comments on Zierler’s thesis about how “ecocide” entered scientific and public discourse. I also wanted to solicit comments from experts on some of the important figures in Zierler’s book. Michael Egan has written extensively about Barry Commoner, whose own warnings about environmental peril were rivaled only by (his rival) Paul Ehrlich. In Egan’s telling, Commoner’s notoriety stemmed from his dissent from the mainstream, and he consistently railed against scientists who did not take their social responsibility seriously. This stands in remarkable contrast with many of the scientists in Zierler’s book who characterized themselves as detached experts. Egan’s current project on the global history of mercury pollution suggests a kind of ecological thinking that surely has one or two roots in the mangroves of Vietnam. Finally, I was delighted that J. Brooks Flippen agreed to participate in this roundtable. Over the past decade, Flippen’s Nixon and the Environment has become a standard work, and is an excellent entry point for those looking for an in-depth analysis of presidential policymaking on environmental issues. One of Flippen’s central points was that Nixon’s environmental successes were half-hearted at best, targeting a constituency that his Vietnam policies had lost him. Another of his books, Conservative Conservationist, traces the career of Nixon’s environmental guru, Russell Train, through successive presidencies, and is an instructive guide through the evolution of “the environment” in American politics in the past half-century. William A. Buckingham, Jr., Operation Ranch Hand: The Air Force and Herbicides in Southeast Asia, 1961-1971 (Washington, D.C.: Government Printing Office, 1982). See p. 184. “U.S. Helps Vietnam to Eradicate Deadly Agent Orange,” BBC News Asia-Pacific, online, 17 Jun 2011. http://www.bbc.co.uk/news/world-asia-pacific-13808753. Accessed on February 10, 2012. Brian Balogh, Chain Reaction: Expert Debate and Public Participation in American Commercial Nuclear Power, 1945-1975 (New York: Cambridge University Press, 1991). Amy M. Hay, “Recipe for Disaster: Motherhood and Citizenship at Love Canal,” Journal of Women’s History 21:1 (2009), 111-134; Amy M. Hay, “A New Earthly Vision: Religious Community Activism in the Love Canal Chemical Disaster,” Environmental History 14:3 (2009), 502-527. Michael Egan, Barry Commoner and the Science of Survival: The Remaking of American Environmentalism (Cambridge: MIT Press, 2007). J. Brooks Flippen, Nixon and the Environment (Albuquerque: University of New Mexico Press, 2000); J. Brooks Flippen, Conservative Conservationist: Russell E. Train and the Emergence of American Environmentalism (Baton Rouge: Louisiana State University Press, 2006).